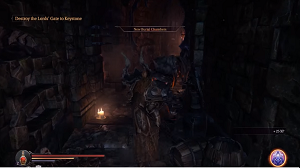 Catacombs is a location in Lords of the Fallen. This area is a maze area carved into a mountain side with many entrances. Dangers abound within them, but it also hides away special rewards. The Catacombs are clearly much older than the rest of Keystone. Who knows who built them and what was their original purpose. They still have many more uses than just a place to bury the dead. There’s a lot of loot and even more tough opponents in the Catacombs. It is also relatively complex and maze-like location. Your main goal is the Champion boss at the final arena, but to open the arena you have to make sure you pull the big lever that is just above its gate 23. Look for it on the upper circle of cells, surrounding the arena. Start the boss fight after saving your game at the nearby Shard 24 . After having defeated the boss, you should be greeted by one of Antanas’ guards, who invites you into the Citadel through the door nearby 25 . To your right, there is a rune door that holds a chest with the My Axe greataxe. Further ahead, a passage opens to the right and you will note a door to open. Kill the enemy and retrieve a Human Skullin the same room as the Dimension Portal for this area. Backtrack to the pathway before this door and continue on deeper. The door after the three enemies here has a chest with Grip. Continuing on this path, another door will reveal an ambushing spider on the ceiling. Deal with it and then open the room's chest with the Living Legend Head, Chest and Legs. Head down the stairs just past the room and kill the two enemies there and pick up the Human Skull. Then head left up the stairs (grab the other Human Skull), kill the enemies, and pick up the lore Purification. Then open the sealed rune chest that contains the Cold Blood Chest, Wrist and Legs, and hit the switch to open the shortcut to the checkpoint. Then head back down the stairs. Go straight ahead into the tunnel looking area and take a second set of stairs down. There will be a couple of enemies there, kill them and break the barrels to reveal a Magic Energy Shard. Also Nearby is a pit with some wooden boards over top, careful here, make sure you either jump over it or keep you armor weight below 23.75, as any weight above this will cause the boards to collapse and you will die. Upon entering the mines there will be a shield enemy and a door to your left. Inside the room there is a lore ( Kyle's Sword) and the tomb of Sir Samwhel of Aron. Note this room as you can place Heirloomatop the tomb and it will upgrade it. Continuing on down the corridor there will be a room with a large shield enemy and archer. At the other side of the room is a door that takes you to the Burnt Watchtower. Head back through the mines to the Old Burial Chamber. Turn right coming out of The Mines and head up the stairs to the Royal Tomb. On the left will be a Human Skull, grab that and head right through the door and into the room across the hall. Kill the enemy and pick up the lore, Mutations. There is a trophy for kicking a corpse into the pit in this room and you can do that while you are here. Head back out the door and turn right and go down. There is a Small Sealed Rune and some boards on the right that you can break through that lead to the Collapsed Tunnel. There is a locked door on your left that opens with a pressure plate, a path leading up on the right and a door past that on the left that contains Bloodsick. If you head up the path there is a Human Skulldirectly above it, another by a locked door to Champion (that will open after you defeat him) and a pressure plate that opens the locked door below. In the locked room there is a Human Skull and Twinkling Axe. Head back the way you came, towards the Royal Tomb. Go straight and jump the plank and pick up another Human Skull and enter the Well of Death. Kill the large Rhogar here and pick up the lore, Care (to the right of the entrance). To the right, behind a wall is a chest containing the Harmony Armor Set. If you head straight (from the entrance) you will go back to the New Burial Chamber. You can go up stairs on either side, but if you take an immediate left (from the entrance) you will go to The Pit. Entering The Pit there is a Human Skull on the ground and you will be ambushed by several enemies immediately. There is a sealed rune chest here. Open it to find Scab. Kill the large Rhogar and use the pressure plate to open the first door on the left of the next hallway and acquire Bloodlust from the statue in this room (there is also an Energy Shard in a pot). (Door closes before you reach it? Use Prayer!) Past that door is another door on the right containing a spider on the ceiling and the lore, End of the Line. Continuing on will lead you to an area we will come through later, so head back to the Well of Death and head up the stairs to Cell Circle. Kill the large shield Rhogar and roll through some barrels on the right to reveal a passage with a room on the right. In the room is an Energy Shard and Blacksmith station. Up ahead is a door that will be unlocked later on. Head back and roll under the gate and go right. There is a lore, Doubts on the ground behind a cage on the left wall. There is a Magic Energy Shard in the barrels. Up ahead is a checkpoint and some enemies. Kill them and head up the stairs and to the right. Kill the archer and open the chest to obtain Living Legend Head and Wrist and an Attribute Point Shard. Head back down to the checkpoint and grab the Human Skull. Head left and pull the lever on the left wall. The first door opened contains an enemy and the lore, Blind Fury. The second door contains an enemy and a Human Skull. The third door contains an enemy. Continuing on there are 2 Human Skulls on the ground. Pull the next lever and kill the enemy in the first door and pick up Vanguard Blade. The second door contains a Human Skull. The third door contains an enemy. Up ahead is an Infested Monk, a Hound and a Human Skull. If you talk to him he will tell you that he wants you to open his cell and kill him. You will need to grab the Lever Handle from a room up ahead and come back and use it on a gear missing a lever nearby. Going forward there is another lever on the left. In the first door is an enemy and the lore, Politicals. There is a breakable wall on the right side of this room that contains the hammer Heirloom. You can upgrade this weapon in the room mentioned in The Mines section. The second room contains a Human Skull. The third door contains the lore, The Branded. Up ahead is a large lever that is one of the two levers needed to open Champion's room. Pull it and grab the Human Skull on the ground just past it. You can go left or straight at the statue, we're going to go straight. There is a door on the left. Open it and pick up the Lever Handle. Up ahead is another lever on the left, pull it. The first door it opens contains the lore, Sven's Hammer. The second door reveals a passage to the Blacksmith station that you were at before. Moving forward there is a Human Skull and the checkpoint from before. Head back to the Infested Monk and use the Lever Handle to open his cell. Kill him to acquire a Spell Point Shard. Turn around and go to the cell next to him and pick up Blocker. The third door opened with the Lever Handle contains a Human Skull. Past the lever that opens Champion's room again, now go left. There are some cells on the left. 2 contain Monks that were imprisoned. You can only save one of them with the Cell Key in the chest next to them. Use the lever next to the chest to open the gate and kill the enemies there, grab the lore, Deep Down and head down the stairs to the right. If you head left you will head back to The Pit. Hit the checkpoint and kill the shield enemy beneath the stairs. Grab the Human Skull immediately to the right, kill the spider and pick up the lore, Troublemakers. Pull the lever up ahead and open the gate to Champion. There is large gate that was shown during Champion's intro scene. It will open and there will be loot inside once you defeat Beast. After defeating Champion, an NPC will appear and a door will open to the right. There is a Human Skull on the ground and the door directly inside will take you the Keystone Citadel and up the stairs to the left are some enemies and the lore, Troublemaker. Pulling the lever will open a shortcut to Cell Circle. Head back down the stairs and through the door to Flooded Halls. Once inside the Catacombs head right, kill the Rhogar and head down the passage way on the right (second door). Take an immediate right, kill the Rhogar and use the Dimension Portal that is now opened since you killed Champion. 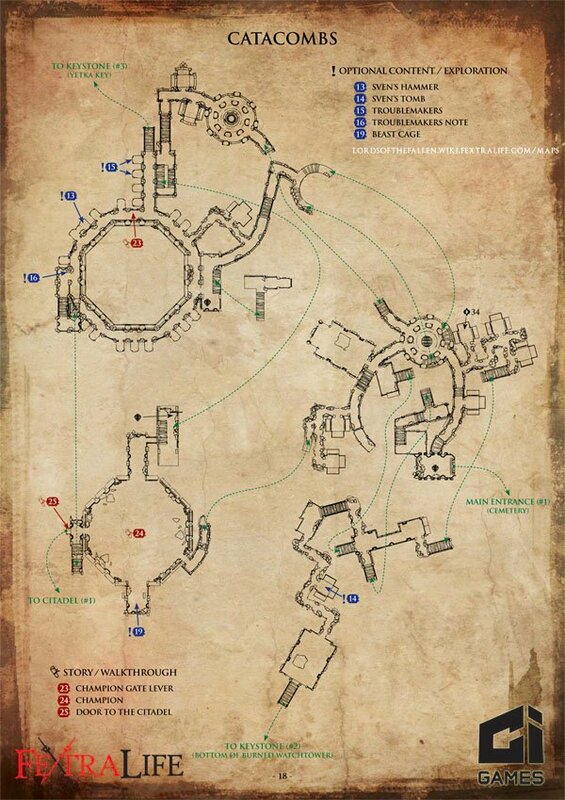 Inside is a Proving Grounds, and if completed, contains a chest with a Spell Point Shard, Empty Bottle and Life Leech. After completing the Portal, head back to the entrance of the Catacombs, and go left (through the shortcut you opened when you were here) and head down the stairs to the left. Kill the archer and go up the stairs to the left. Head to the right and go through the door and across into the room. There will be a corpse laying on the ground near the pit. If you knock it in you will get the Fool of a Tuck Trophy/Acheivement and will be ambushed by a Hound. Go out the door, and head down the stairs to your now left and head through The Mines to the Collapsed Tunnel. Head up the ramp and head through the door on the right (now open) and into Champion's room. Beast's cage will now be open on your left and the lore, More Than Human, Vicious Prison and I Swear to Him will be on the ground. The chest contains Persistence Head and a Ghost Merge Shard. Head back to the Abandoned Temple (rhogar realm) through the graveyard now. If you decide to visit the Catacombs before even beating the 2nd boss or the 3rd. Do not pull the lever for the 4th boss. The gate will not open and the game with glitch out with lever down. That means when you finally do reach this boss you cannot re-use lever for gate. Cannot progress further and will have to erase game save.